Coordinate Physical Eviction with Sheriff - Puckett & Redford P.L.L.C. We can obtain a court order for eviction through a Default Judgment, a Judgment if the tenant does not comply with the stipulated payment plan, or after a Show Cause Hearing. After a judge or court commissioner signs the Court order for eviction, we take the order to the clerk of the court who issues the Writ of Restitution. We then take the Writ to the Sheriff’s office and pay the appropriate fee for delivery of the Writ to the tenant. We must also provide the Sheriff with a key or code if the property is “limited access” and the bond for a commercial eviction. The Sheriff usually delivers the Writ to the tenant on the next business day after receiving it. 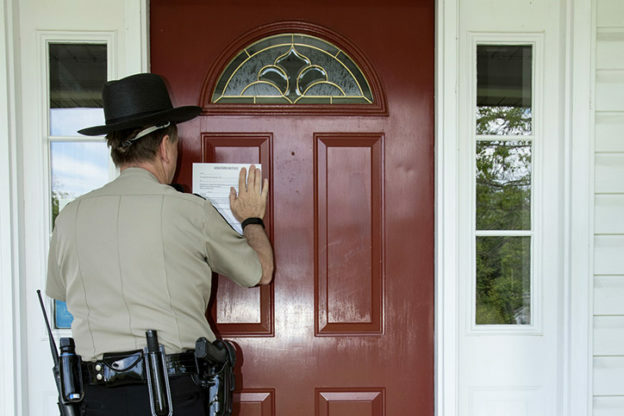 If the tenant does not voluntarily vacate – in our experience many do – we coordinate with the Sheriff to obtain a date for the physical eviction. This date will vary after the Writ is delivered to the Sheriff. We suggest that the landlord closely monitor the property after the Writ is delivered to the Sheriff. Most tenants will vacate without advising the landlord. The landlord does have a limited right to enter the property after a Writ has been issued in order to determine whether the tenant has vacated. If you find that the tenant has vacated, please notify the office and we will cancel the physical eviction with the sheriff. If there is a physical eviction, the sheriff is there to keep the peace, not to do the actual moving of the property. The deputy will point out a place for the personal property to be placed when removed from the property and will give the landlord approximately 1 hour to complete the move. Make sure that there are sufficient people to completely empty the unit in 1 hour, and to change the locks, if necessary. At the time that we deliver the writ of restitution to the sheriff, we are also required, in the case of a residential eviction, to deliver the notices to the tenant to request the storage of property. If you receive such a form back from a tenant, please notify our office immediately so that we may guide you through the process and coordinate with the Sheriff.